Thanks to its population growth rate, Africa has one of the highest numbers of teenagers in the world. Africa is a vast continent with 52 countries, thousands of languages and peoples, numerous religions, and a diverse landscape, but the teen life-covered here in 15 representative countries-still has basic commonalities. 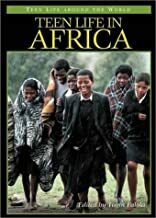 African teens can go to school, tend animal herds, serve as farm help, or learn a trade; they belong to large family networks and participate in communal activities; they enjoy sports and hanging out with friends; and they mix modern and Western influences, such as fashion, with more traditional values. This book explores the lives, cultures, and opportunities of African teens, offering students and general readers a substantial understanding of this important group. About Toyin Falola (Editor) : Toyin Falola is a published editor. Published credits of Toyin Falola include Africa in the Twentieth Century: The Adu Boahen Reader, Teen Life in Africa (Teen Life around the World).